The CIRCLE THINGY is a simple tool based on parts of the Circlelord. It is used separately and cannot be made from Circlelord parts. 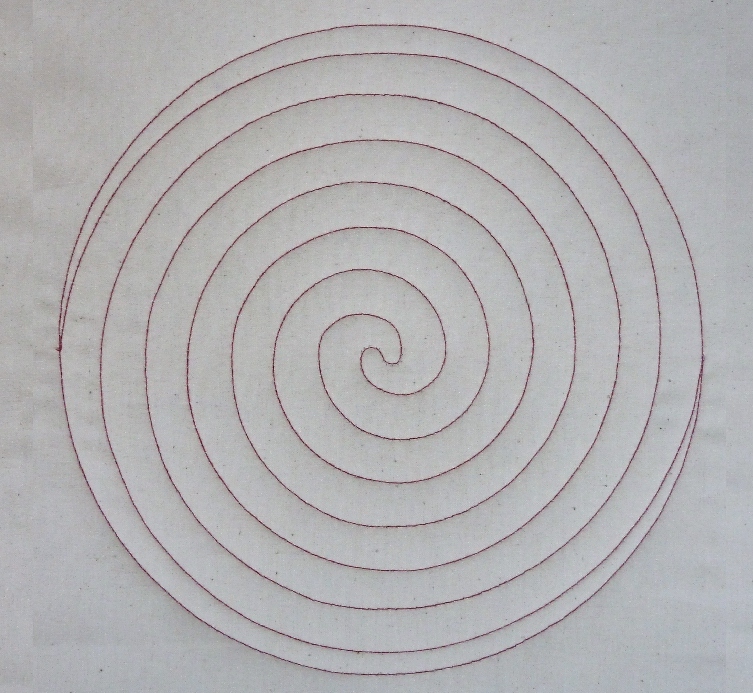 It makes concentric circles from 1" to 12 1/2" about 1 thread width apart, and Spirals, both single and double. The enclosed spirals design is 8.5" diameter and the line separation is 1" for the single and 1/2" for the double. "Oh how I love the look of quilted circles on a quilt top. The trick was how to quilt them perfectly without taking a lot of time to do it. 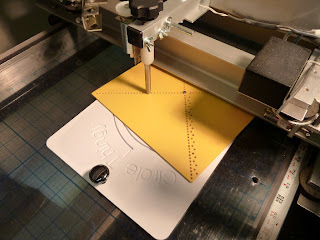 My customers didn’t want to spend the money for the extra time it took me to quilt perfect circles with a ruler. Well, the answer is Circle Thingy. I was thrilled when I first quilted using Circle Thingy. 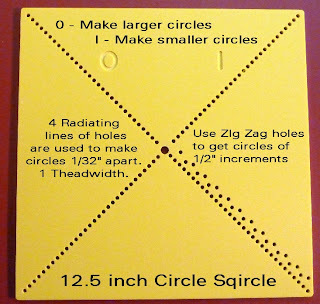 With this new tool, I am able to quilt a wide variety of circles sizes quickly & perfectly without the fuss of rulers or other cumbersome equipment. 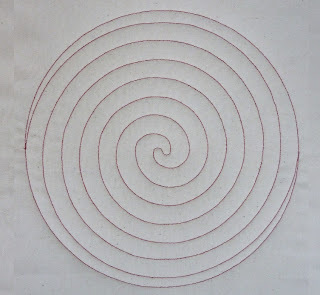 I was amazed at how easy it was to center my circles & quilt them. 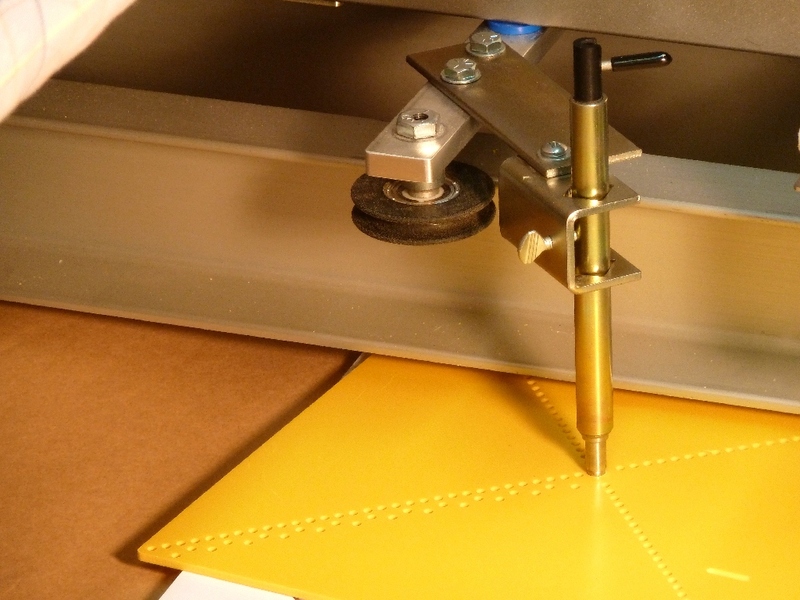 The stylus is easy to install & solid when in use. 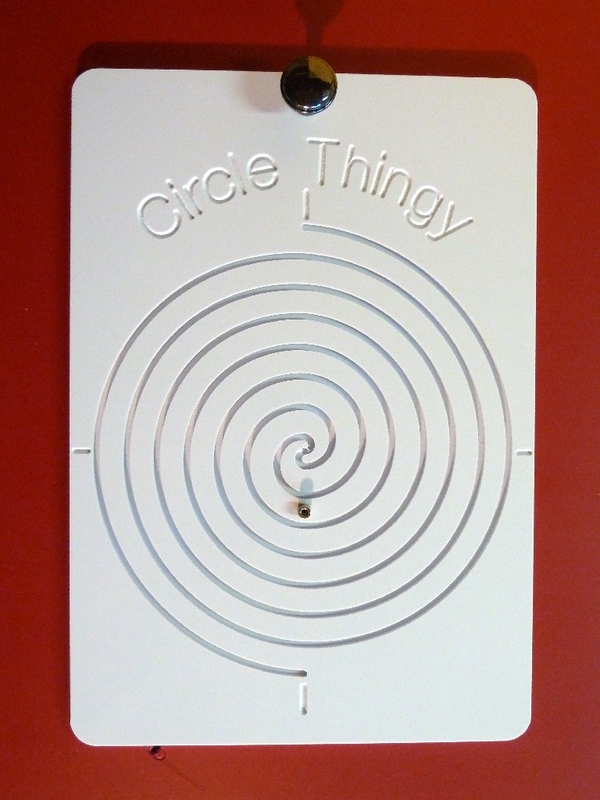 Circle Thingy doesn’t move around when in use either but it’s easy to reposition. 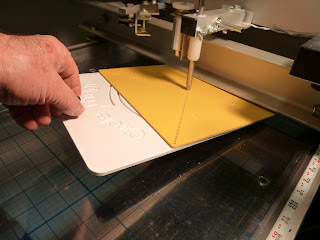 I love this tool called Circle Thingy but more importantly, my customers love how it gives their quilt tops personality and that new modern look. 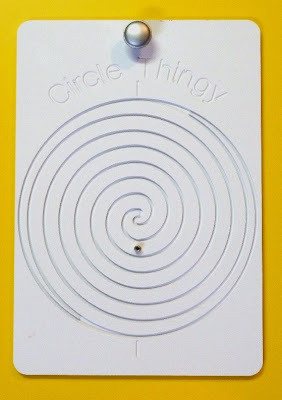 Circle Thingy is affordable & easy to use. What more could we ask for? Circle Thing Base Plate with Knob for lifting and shifting, Spirals pattern and Center Post. The Base Plate has a rubber mat backing. 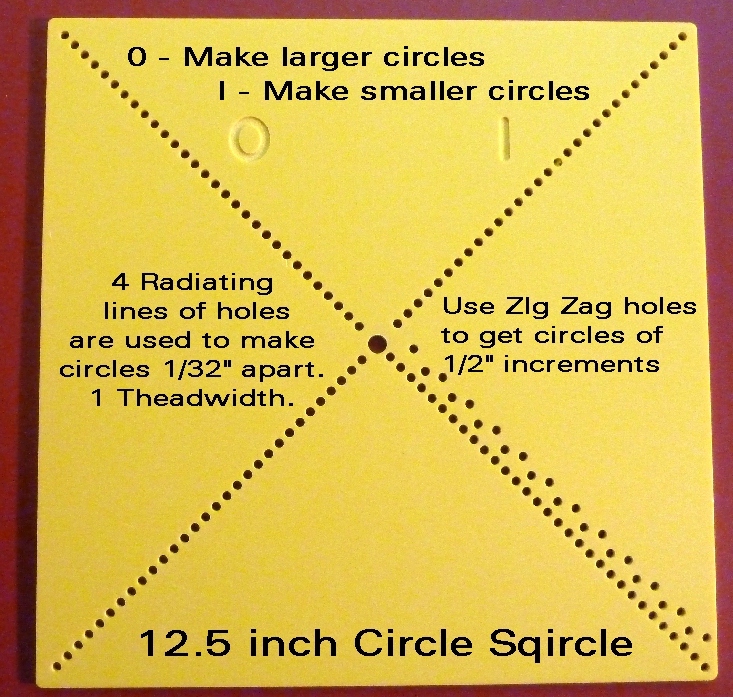 12.5" Circle Sqircle showing attributes. and turn the other direction to go to smaller Circles. 1" to 12.5" with 1/2" increments. to where you want to make circle. Circle Thingy slides when lifted and sticks to table when flat. Picture shows Circlelord stylus set. Stylus sets available for most long and mid arm machines. 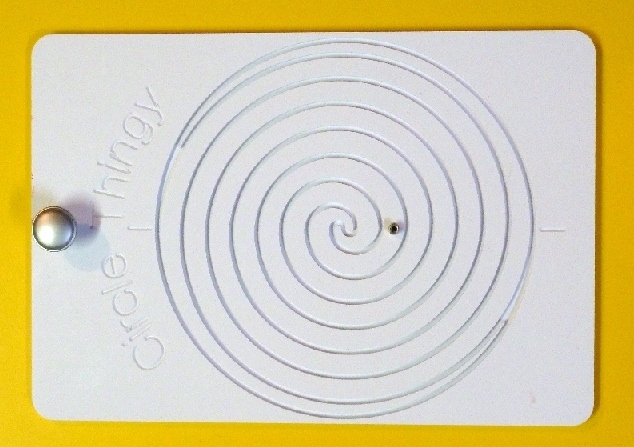 the Stylus is lifted and the needle moved circle circumference. 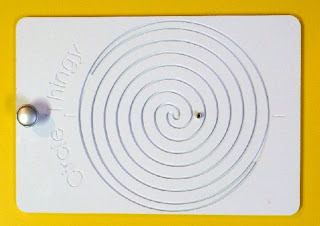 Drop the stylus on the Sqircle surface and turn the Sqircle until the Stylus drops into a hole. Move the machine in a circle to check out the position of the circle. When satisfied, stitch the circle. 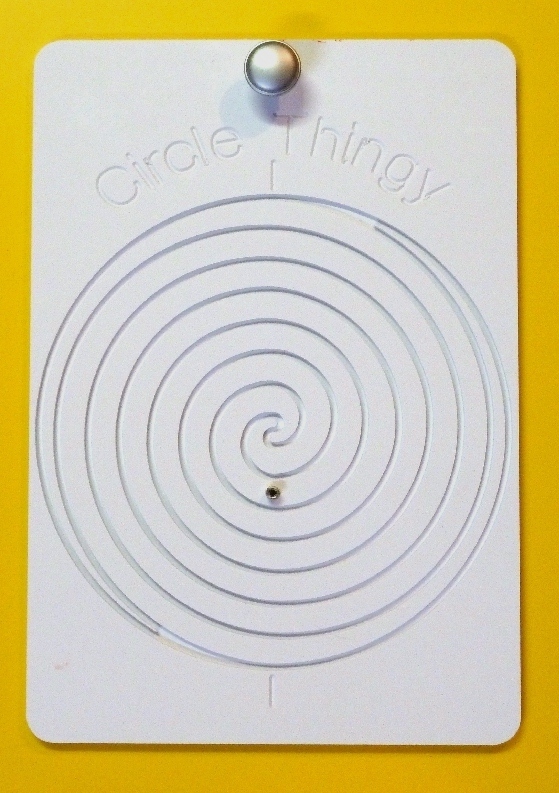 Picture shows concentric circles. Click on picture for more detail. Circle Thingy using the Quilt EZ stylus set. 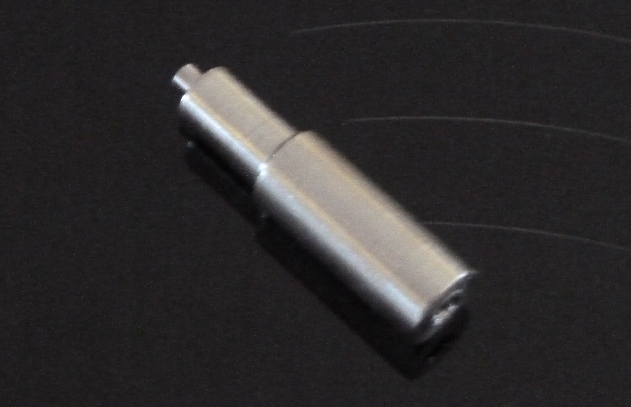 The regular plastic pin will work, but may show some wobble as the pin is much smaller than the Circlelord's pin. You can get a Stainless Steel replacement with the right size for both the Circle Thingy and other Circlelord templates. 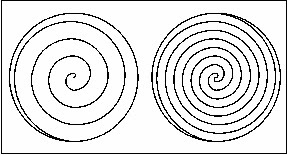 Circle Thingy Spiral pattern options. 1" spiral and double 1/2" spiral. 3 equal payments of $46.33 for Circle Thingy. Shipping will be charged with 1st payment.